It is estimated that more than 14,500 wars have been fought from 3600 B.C. to present day—and that number keeps rising. In fact, during the same time period, there have been 5,305 years of war … and only 292 years of peace. The Bible depicts countless battles. From Genesis to Revelation, its pages reveal there are both physical and spiritual wars raging. Physical wars have dominated history’s attention from the time Cain killed his brother Abel, right down to the present day. This should not surprise us, for Jesus predicted, “And ye shall hear of wars and rumours of wars. ... For nation shall rise against nation, and kingdom against kingdom” (Matthew 24:6, 7). However, the primary focus of Scripture is the ongoing conflict between Christ and Satan. Revelation speaks that what began as a cosmic war in heaven will soon end in Armageddon. In this showdown between the forces of good and the powers of evil, truth and light are under constant attack from deception and darkness. And like it or not, every single one of us is involved. The battleground for this intense spiritual struggle is not some piece of earthly real estate; it is the human heart. Both Jesus and the devil are supremely interested in winning possession of our minds and hearts. For this reason, Christians are called to be more than peaceful spectators or mediators in this cataclysmic conflict. We must be committed front-line commandos. God has designed that all the literal battles recorded in the Bible—from Gideon’s conflict with the Midianites to David’s defeat of Goliath—can serve to teach us how we might experience victory in spiritual combat. Naturally, it should stand to reason that because these battles are of a spiritual nature, the weapons we employ must also be spiritual. This is why Paul reminds us, “We wrestle not against flesh and blood, but against principalities, against powers, against the rulers of the darkness of this world, against spiritual wickedness in high places” (Ephesians 6:12). Although our armor and weapons are spiritual, this does not mean they are unreal or ineffective. “For though we walk in the flesh, we do not war after the flesh: (For the weapons of our warfare are not carnal, but mighty through God to the pulling down of strong holds)” (2 Corinthians 10:3, 4). 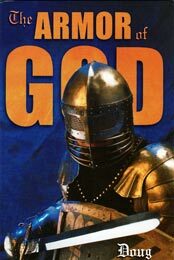 The first time I did a study on the armor of God, I looked up all the Bible references to armor, searching for passages that would support and enhance the importance of wearing armor when charging off into battle. I was a bit disappointed to find that Saul’s armor did not fit David and that Goliath’s armor was useless against David’s stone. I also discovered that a stray arrow found a crack in Ahab’s armor, killing the wicked king. “So much for the value of armor!” I thought. But then I realized that we are not called to wear the faulty body armor of Saul, Ahab, or Goliath. Rather, we must put on the unfailing armor of God! In fact, at the very moment that Paul wrote his letter to the Ephesians, he might well have been chained to a soldier sporting the armor of the Roman Empire. Paul could see firsthand how frail the defenses of man were against the prince of darkness. This is why he twice emphasized “the armor of God.” It is also clear that Paul was expanding on the words of the Old Testament prophet Isaiah, who had made a similar spiritual association for two of the articles of armor. “For he put on righteousness as a breastplate, and an helmet of salvation upon his head” (Isaiah 59:17). Now that we have established that we are to wear the armor of God and not of man, we must be careful not to miss the admonition to wear all of the articles God provides. Ephesians 6:11 cautions, “Put on the whole armour of God,” and Ephesians 6:13 declares, “Wherefore take unto you the whole armour of God.” This is where many Christians fail. They take some of the armor, but forget one or two parts of the suit—and pay an eternal price for their neglect. Under the inspiration of the Holy Spirit, the apostle Paul attaches a spiritual association to seven implements of earthly armor. Let’s consider each of these articles of defense one by one to see what we can learn. In Bible times, the girdle about the waist held together the soldier’s garments, which might otherwise hamper his movements while marching or engaging in combat. The spiritual significance is that God does not simply want us to point at the truth; He wants us to wear it and have it wrapped about us. Not only does the belt hold everything in place, but it also serves to carry the sheath that holds the sword of the Spirit for ready access. Some people have the sword of God’s Word, but without the belt of truth they come to reckless conclusions. Several years ago, I served as a camp pastor by a lake where we were teaching a group of boys to water ski barefoot. In order to ski barefoot, it is necessary to go much faster than when wearing regular skis to stay on top of the water. When a skier falls at these high speeds, it is not uncommon for him to aggressively roll and bounce across the surface of the water before sinking. One evening, we were making a final attempt to teach a determined 11-year-old camper to ski barefoot. As the boat roared along at about 40 mph, for a fleeting moment he was skiing—but then in a flash, he tumbled and began to bounce and roll across the surface of the lake like a skipping stone. When we circled around to where the dazed boy floated with his life jacket on, I noticed that he had a bewildered look on his face. “Are you OK?” we asked. He nodded. “Do you want to try one more time?” we asked. The lad shook his head no. But this time he spoke up. “No,” he said. Puzzled, we repeated: “Are you all right?” He nodded again. “Then what’s the problem?” we asked. Swimsuit manufacturers supply a belt string to prevent such embarrassing situations, but the young man had neglected to tie it. In the same way, many confused Christians have fled naked and ashamed when challenged by the enemy because they had not secured the belt of truth. Never forget that wearing the belt of truth. Never forget that wearing the belt of truth also means wearing Christ, for He is “the way, the truth, and the life” (John 14:6). This is why Paul said: “For as many of you as have been baptized into Christ have put on Christ.” (Galatians 3:27, emphasis added). The breastplate was an important article of defense that protected the front torso and all of the vital organs from a mortal wound. It was often composed of a solid piece of metal, but it could also contain numerous small pieces that were sewn to cloth or leather that overlapped much like the scales of a fish. These scales could number as many as 700 to 1,000 per “coat.” When the sun shone directly on the armor, it could become very hot. So to avoid being burnt, or even pinched, by the moving metal plates, the soldiers always wore a sturdy robe under the armor. In other words, wearing the breastplate of righteousness is always in partnership with the robe of Jesus’ righteousness. “I put on righteousness, and it clothed me” (Job 29:14). Also keep in mind that the high priest wore a golden breastplate over his linen robe that was set with 12 precious stones, each inscribed with one of the names of the 12 tribes of Israel. This place represented nearness to the heart. “And Aaron shall bear the names of the children of Israel in the breastplate of judgment upon his heart” (Exodus 28:29). The only way we can experience victory in battle against the devil is through confidence that the righteousness of Jesus covers our hearts and that we are forgiven. Another interesting aspect of the breastplate was that it offered no protection to the person’s back. It was assumed that soldiers would not turn their backs toward the enemy to retreat. Likewise, Christian soldiers should stand firm and never surrender any ground to the devil. Instead, let the devil flee from your steadfast loyalty. “Submit yourselves therefore to God. Resist the devil, and he will flee from you” (James 4:7, emphasis added). This was the strategy employed by Jesus to emerge victorious after being tempted by the devil in the wilderness. “Then Jesus said to him, ‘Away with you, Satan! For it is written, ‘You shall worship the Lord your God, and Him only you shall serve.’ Then the devil left Him” (Matthew 4:10, 11, NKJV). The warrior’s shield was his first line of defense. Usually made of wood or bronze, it was often big enough to protect the whole body when the soldier crouched down under a hail of arrows. Likewise, faith in Christ’s blood is our first defense against the great accuser (Zechariah 3:1–5). The enemy is constantly firing volley after volley of those flaming arrows of carnal desire. The purpose for this shield of faith was to deflect the fiery darts of the enemy and prevent them from ever making contact. Multitudes of Christians fall on the battlefield and fail to overcome evil because they wait until they are immersed in the fires of temptation before making any effort to resist. At that point, it is often too late. As soon as you recognize a fiery dart sailing toward you, there is no time to lose. Hold up that shield of faith and do everything in your power to keep as much distance as possible between you and the temptation. If we yield without a fight, we are in reality inviting temptation. The shield was not held loosely in the soldier’s hand, but was firmly strapped to his forearm so he could resist the mighty blows of an enemy’s sword without fear of dropping it. Likewise, Christians cannot afford to have a flimsy faith while in the heat of spiritual battle. The shields of old were also often of a distinctive nature, sometimes marked with the insignia or name of the king to help soldiers avoid fighting their own comrades in the confusion of battle. In the same way, when the devil sends his flaming arrows of temptation, we are to hold up the shield bearing the name of our King of kings, Jesus. Through faith in His name, we can resist any enticement. “There hath no temptation taken you but such as is common to man: but God is faithful, who will not suffer you to be tempted above that ye are able; but will with the temptation also make a way to escape, that ye may be able to bear it” (1 Corinthians 10:13). In another instance, simply wearing a helmet improperly proved to be a fatal mistake. The giant Goliath became outraged that young David would dare come against him with nothing more than a shepherd’s staff and sling in his hand. Goliath’s haughtiness apparently prompted him to carelessly push back his helmet, because minutes later a smooth stone from David’s sling had sunk deep into the giant’s forehead (1 Samuel 17:40-49). Some professed Christians have “rocks in the head” from neglecting to wear their helmets. But the purpose for this helmet of salvation is not only to keep out the rocks, but also to keep in the brains! Your mind should not be open to anything and everything. As we study and come to understand God’s Word, there should be a settling into the truth “that we should no longer be children,tossed to and fro and carried about with every wind of doctrine, by the trickery of men, in the cunning craftiness of deceitful plotting” Ephesians 4:14, NKJV). In the Bible, the foot is a symbol for the direction or “the walk” of a person’s life. Having our feet shod with the preparation of the gospel of peace gives us good footing—and prevents backsliding as well. As we become involved in spreading the good news, it will strengthen us (and others) against the enemy’s attacks. “How beautiful upon the mountains are the feet of him that bringeth good tidings, that publisheth peace; that bringeth good tidings of good [things], that publisheth salvation” (Isaiah 52:7). Growing up in New York City, my brother Falcon and I would occasionally go ice-skating at Rockefeller Center. On one of these days, he and I got into a little sibling disagreement, and I discovered that it is very difficult to box while wearing ice skates. Having good footing in a fight is essential for victory. Otherwise we are prone to slide all over the place. A friend of mine was hiking in some blistering hot desert mountains when he came upon a large, fast-moving creek. After taking a drink, he removed his new hiking boots and socks to avoid getting them wet as he crossed the creek. But despite his careful efforts, he lost his footing and slipped on a wet rock, losing both his new boots and socks into the rushing water. He then described the agony of hiking barefoot for miles on burning-hot rocks through cactus-lined trails. The lesson that my friend learned applies to the Christian life well. You don’t want to be caught without your gospel shoes while journeying through this wilderness! Don’t remove your gospel shoes for any reason. We never need to worry about them wearing away; God will resole them every time we return to the cross. If we are faithful, He will say to us as He did to the children of Israel: “Your sandals have not worn out on your feet” (Deuteronomy 29:5, NKJV). The sword was the most common weapon in battle. Indeed, the word “sword” appears 449 times in Scripture. The other armaments in God’s arsenal are defensive in nature, but the sword is primarily an offensive weapon. In fact, the sword of God’s Word is what Jesus used against the devil and it also gave the beast of Revelation 13 a deadly wound (Revelation 13:3, 14). When Jesus said, “I did not come to bring peace but a sword,” He was not saying that He, the Prince of peace, had come to start wars (Matthew 10:34). Rather, He was pointing out that the sword of God’s Word has a dividing effect. The two edges of the Spirit’s sword are the two witnesses of God’s Word, the New and Old Testaments. It is also called a two-edged sword because it is to be used both against the enemy and for personal use. Like the Philippian jailer, we must be ready to apply the sword of God’s Word to ourselves (Acts 16:27). Ancient soldiers also used their swords for cooking, splitting kindling, and for cutting the ropes that bound their captives to set them free. Likewise, the Word of God is a practical tool for every area of life, as well as in fighting the devil. In Bible times, there was no stainless steel. A sword unused became rusty, dull, and pitted. Swords were kept clean by frequent use or by honing them against a stone (the Rock of Ages) or another soldier’s sword. “Iron sharpeneth iron” (Proverbs 27:17). Likewise, when we study the Bible with others, our skill in the Word is sharpened. A soldier traveling in enemy territory never left his sword out of reach. In the same way, a Christian should “be ready always to give an answer to every man that asketh you a reason of the hope that is in you with meekness and fear” (1 Peter 3:15). “Watch and pray, that ye enter not into temptation” (Matthew 26:41). “Take ye heed, watch and pray: for ye know not when the time is” (Mark 13:33). “Therefore let us not sleep, as do others; but let us watch and be sober” (1 Thessalonians 5:6). “All prayer” is essentially the same thing as praying without ceasing (1 Thessalonians 5:17). This does not mean we go about on our knees all day; rather, we must be constantly aware of God’s presence and that there is an enemy stalking us. In the story of Nehemiah, we find God’s people were under constant threat of attack. This group was a good example of this ready watchfulness. “They which builded on the wall, and they that bare burdens, with those that laded, every one with one of his hands wrought in the work, and with the other hand held a weapon. For the builders, every one had his sword girded by his side, and so builded. And he that sounded the trumpet was by me” (Nehemiah 4:17, 18). Three times Paul urges his readers to “stand” with the armor. An army is no better than its discipline; without it they are doomed. It is time that we, as God’s soldiers, stop simply discussing His commands and begin obeying them. “Fight the good fight of faith” (1 Timothy 6:12). If we don’t stand for something, we will fall for anything. During a fierce Civil War battle, one Union company was fighting under a hail of bullets to take a strategic hill from the Confederacy. After making progress halfway up the hill, the weary soldiers became discouraged by the constant barrage and began to retreat back down the hill. Then they noticed that their standard bearer, who carried the company flag, refused to fall back. A standard bearer’s job was to hold the flag over the territory occupied by his army. “Bring the standard down to us,” shouted the young man’s cohorts. But despite the fact that cannons were exploding all around him, this courageous soldier was unwilling to yield an inch. He called back: “No! You come up to where the standard is.” Inspired by the bravery of their comrade, the Yankees renewed their efforts and took the hill. Too many of God’s soldiers are fraternizing with the enemy and trying to reach the world by bringing the standards of the church down to its level. God is calling us to bravely come up to His standard. One of King David’s mighty men was named Eleazar. He became famous when the army of Israel retreated and fled from the enemy because he stood his ground by David’s side, and the two of them fought back to back until they had defeated the Philistine force (1 Chronicles 11:12–14; 2 Samuel 23:9). When everyone else retreats, we must hold the line. If you were baptized, you made a promise to God, and the force of that commitment has not diminished at all over time. When you enlisted in God’s army, you promised to work in and attend the church, return your tithe, dress modestly, eat and drink to the glory of God, and care for your body temple. God calls you to be extraordinary and different—to stand firm in a world of gutless wonders. If you’ve been tempted to retreat, turn around and come back up to His standard. In closing, I want to assure you that although we are in a war, we need not fear. God’s Word tells us how the battle will end and who will be the final victor. The One who forged our armor guarantees its effectiveness and promises that “the gates of hell shall not prevail against it” (Matthew 16:18). How can we stand? How can we fight? Paul gives us the answer in the beginning of our passage. “Finally, my brethren, be strong in the Lord, and in the power of his might” (Ephesians 6:10). Jesus said, “Without me ye can do nothing” (John 15:5). But we are also assured, “I can do all things through Christ which strengtheneth me” (Philippians 4:13). In his first letter to the church at Corinth, Paul asks, “Who ever goes to war at his own expense?” (1 Corinthians 9:7, NKJV). God pays the bill for the entire arsenal. All that we need was purchased at Calvary with the blood of His own dear Son. Just as Jonathan so loved David that he gave him his armor, sword, robe and indeed his very throne (1 Samuel 18:3, 4), so Jesus gives us all we need to be assured of total and final victory. Till then, we’ll fight for the day when “They shall beat their swords into plowshares, and their spears into pruninghooks: nation shall not lift up sword against nation, neither shall they learn war any more.” (Isaiah 2:4). How Can I Have Purity, Peace, and Power?